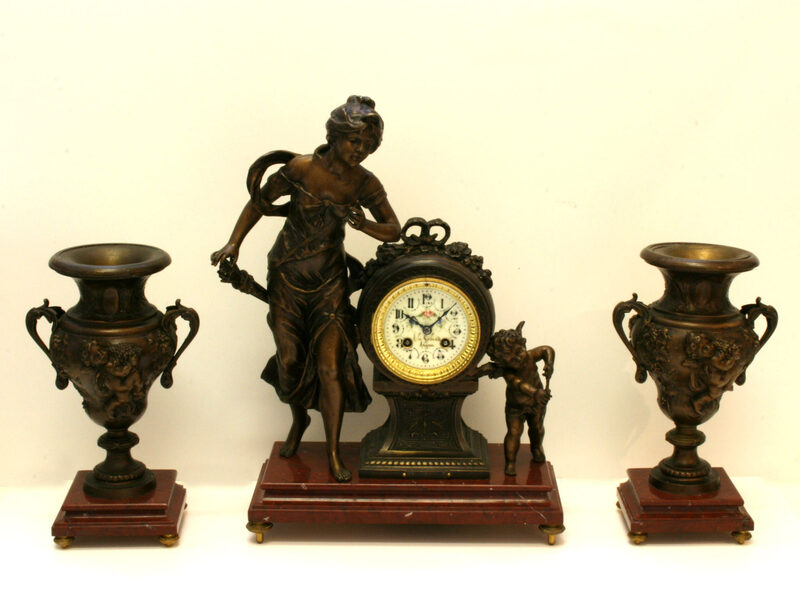 Product code: 1596 Categories: Sold Items, Sold Watches. 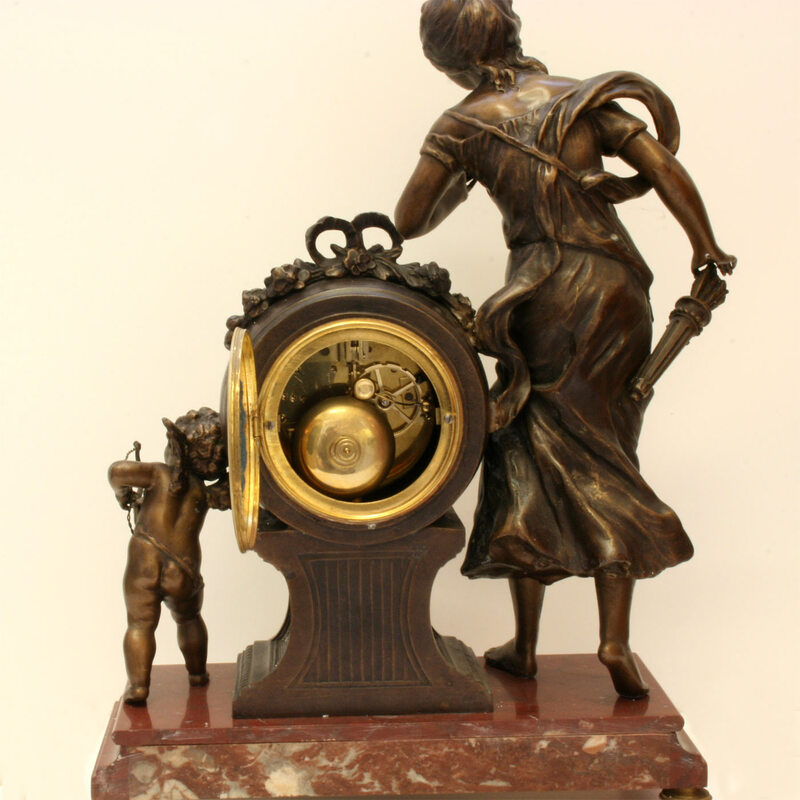 This is a truly magnificent antique clock made in the 1880’s and with such a wonderful scene. 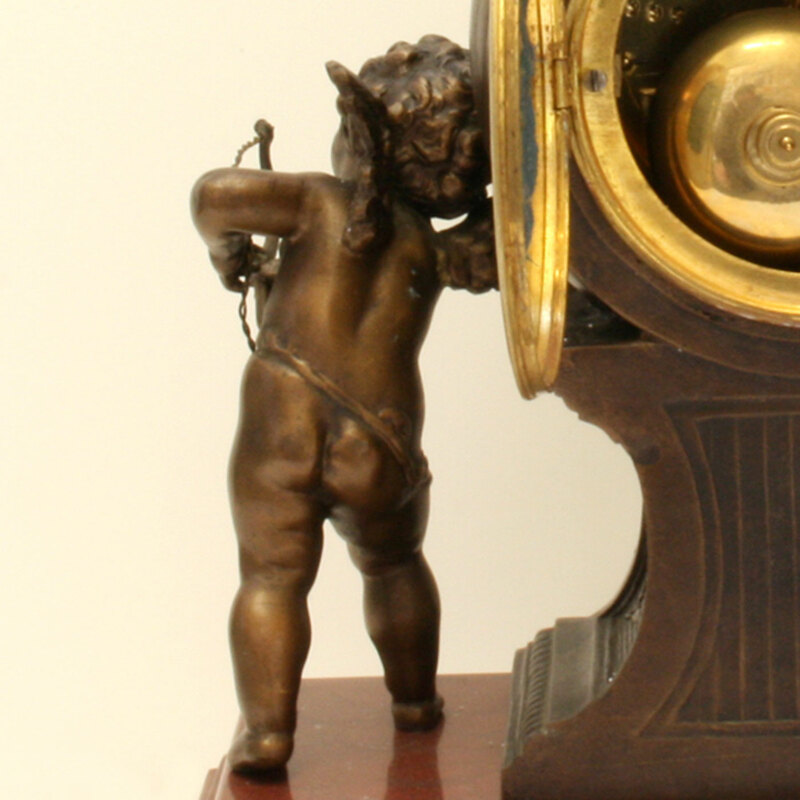 The images are named “l’Amour Desarme” meaning “Venus disarms Amor” where Amor is “love” another name for cupid. The story is known as “The tale of Amor and Psyche” and is where Venus who is so envious of Psyche and her beauty, sends her son Cupid to shoot Psyche with his golden arrow and make her fall in love with a vile looking creature. After flying into her room, he makes himself invisible and just as he is ready to shoot his arrow, she awakens and stares straight into his eyes, even though he is invisible. Startling him, he scratches himself with his arrow and falls deeply in love with her, which later enrages Venus. The story continues, but that is another story. 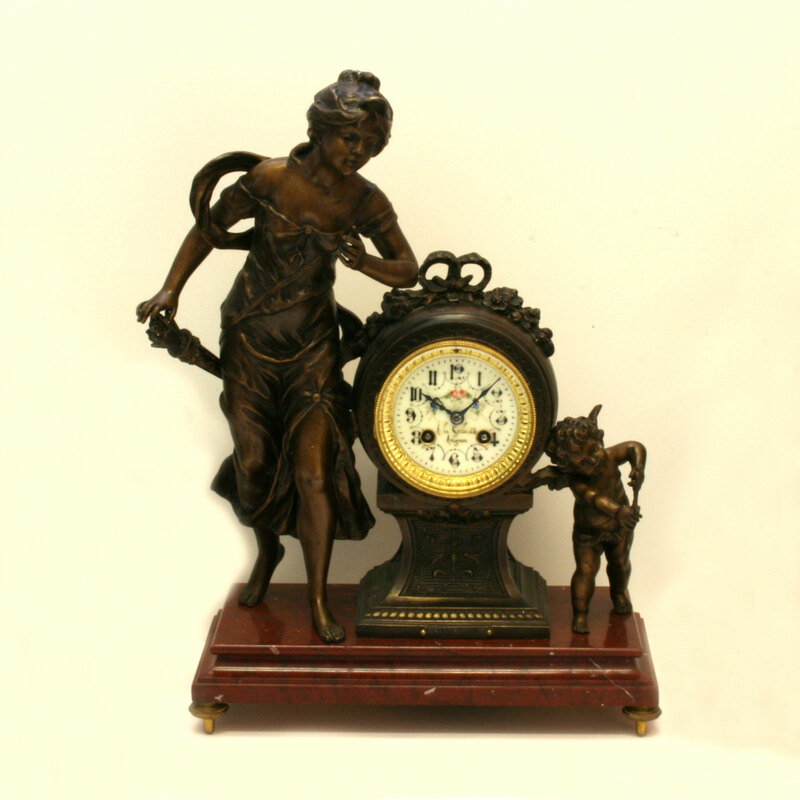 With the clock measuring 44.5cm (h) by 31cm (l) x 14cm (d) and the garnitures each measure 28.5cm (h) x 17cm (w) x 15cm (d), this antique clock will make a wonderful addition to any room. Inside, the movement is an 8 day time and strike movement by F.Marti, and it has been fully serviced and runs perfectly. The sculpure was made by Louis Auguste and Hippolute Francois, who made wonderful romantic sculptures in bronze and spelter. 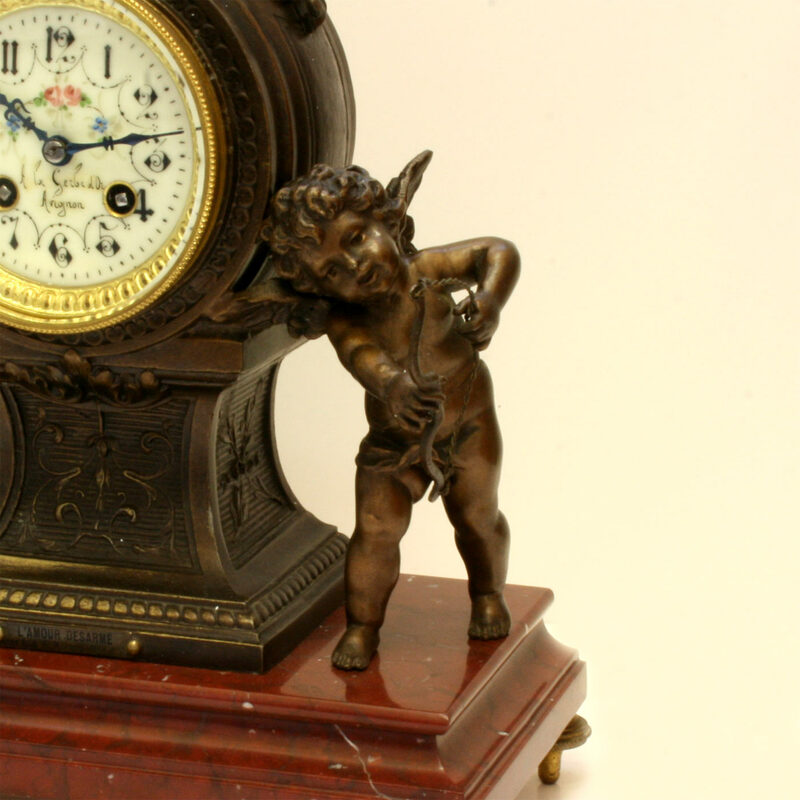 If you are after a clock that truly speaks for itself, and has a wonderful story atached, then consider this magnificent antique clock, and you will find that it is so easy to fall in love with it.